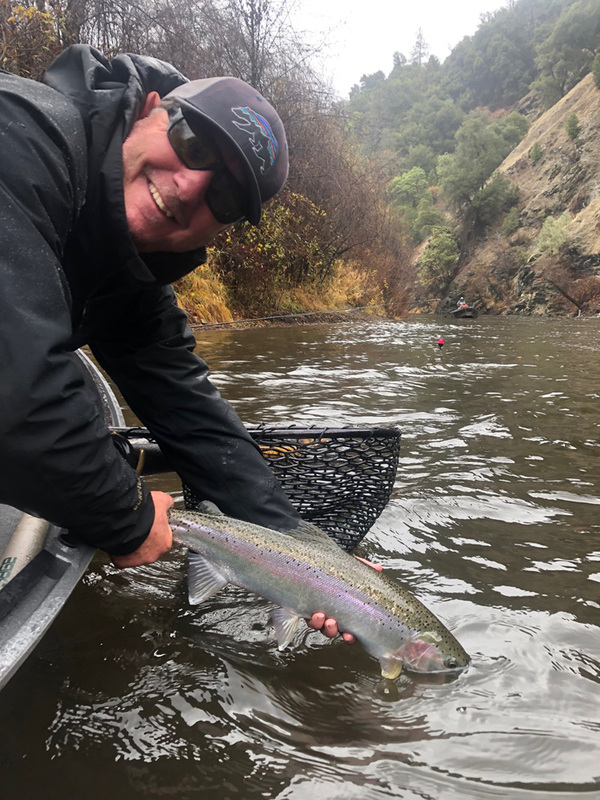 It’s Wednesday’s Wild and Wet Winter … a CalTrout, Keepemwet Fishing and Lost Coast Outfitters initiative celebrating California’s wild winter steelhead. Last week we spoke with steelhead guide Jeff Hickman about some science-based techniques for landing and photographing steelhead while wading. This week let’s discuses some ways you can land a wild steelhead from a boat and still get a great photo for the album but also keep the fish wet and happy so it has the best chance at succeeding on this incredible journey to return home and spawn. Fishing from a drift boat or raft is an increasingly popular way to chase steelhead and trout. Landing a spunky fish from a boat is and art form in itself and there’s lots of ways It can easily go wrong. There’s also tricks that can help it be a more smooth experience for both the fish and the angler. In all scenarios there needs to be some synergy between the person rowing the boat and the angler. If you have a trophy fish on the line and it’s getting time to bring it in, there’s a couple different ways you can go about it. First of all the it’s time to assess if there’s an easy place to pull over. Beaching the boat and having the angler jump out can be a great option if it’s an easy place to do so. Be careful getting out of the boat with a fish on the line as it can be an exciting moment for everyone. Landing a fish in knee deep slow water will often be the smoothest experience for the fish and also a great way to get a photo of the catch without taking it out of the water. If there’s not an easy place to pull the boat to shore and carefully land the fish then the next best option will be to use a net. Not all nets are created equal. Some nets are harder on fish then others. A rubber basket typically wears less slime off the fish and there’s less chance of splitting fins then mesh. If you are going to use mesh, get the softest fabric you can find. 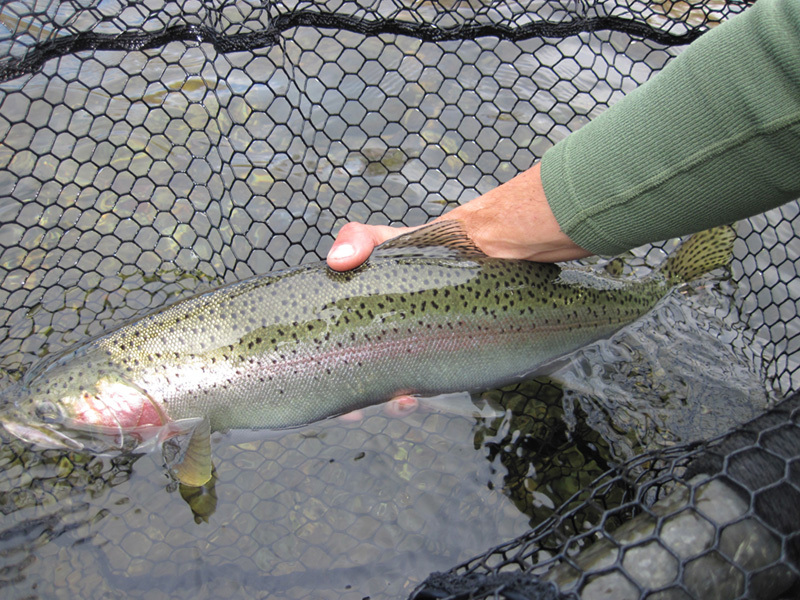 Make sure you have a net big enough to hold the size fish you are targeting. In many cases netting the fish would be a two man job. Often the guide or person rowing will net the fish for the angler in the front or back of the boat. This scenario however is not always possible as sometimes guides will need to stay on the sticks to keep the boat in the right position. As an angler you should always learn how to net your own fish as well so you don’t need to always rely on a second person. A good swipe from downstream of the fish or simply holding the net downstream and steering the fish into it will yield the best results. If the water temps are cold enough as they often are in winter, then it’s easiest on the fish if can play it an extra few seconds so it’s tired enough that it won’t totally thrash around once it’s in the bucket. To calm the fish down, raise the rim of the net so it’s above the water but the fish is still totally submerged. Keep it facing head first into the current. Once it’s calm you can lean over the rail of the boat or raft and gently remove the hook while the fish is in the water. If a photo is warranted, lift the fish gently trying to keep it’s gills underwater. Have the other angler or driver ready with the camera so the photo happens quickly. Or use and under water camera like a go pro. Be careful not to over tip the boat in one direction. While leaning over the rail the other boat mate or mates might need to lean the other direction to compensate for the weight balance. What you should try to avoid is bringing the fish into a dry boat and laying it onto dry metal. If a the fish thrashes around and bashes onto the hard metal floor it can cause head trauma. Fish are used to floating in a weightless world so even slight head bumps can cause severe damage. Also if you remove the hook while the fish is in the boat and then hold it up for a photo or two that process will take a minimum of 30 seconds and usually much more. That’s too much time for a wild fish to be exposed to oxygen which can cause immediate or eventual damage to the fish. Try holding your breath from the time you take the fish out of the water as a reminder so fish intended for release are able to recover.